Established in 1810 on the Isle of Jura, north-west of the Island (and Whisky region) of Islay. As with many other Scotch distilleries, Jura went through a rough patch in the first half of the 20th century. It wasn't until 1960, when two local estate owners, Robin Fletcher and Tony Riley-Smith rebuilt the distillery and introduced taller stills that allowed Jura to create a wider mix of malts. Jura’s Whiskies are just as unique as their place – a range of rich, seafaring Whiskies – some lightly peated, others carrying a heavier peated profile, but each and everyone with a distinct, yet sincere character. 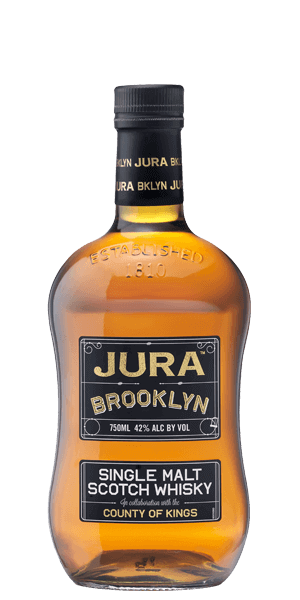 If Jura's one of the most famous Whisky sanctuaries of the world, Brooklyn is the craft food and drinks capital across the pond. An unusual collaboration between master distiller Willie Tait and the famed borough’s most inventive food artisans gave birth to the dram that breaks all the rules. Isle Of Jura Brooklyn Single Malt Scotch Whisky is Kings County first single malt Scotch Whisky. Although technically still made in Scotland, this Whisky is as Brooklyn as it gets – from the flavour to the flair. Jura Brooklyn has been aged for up to 16 years in American White Oak Bourbon, Amoroso Sherry and Pinot noir casks. The collaborators tasted different Whisky marriages paired with Brooklyn’s dietary staples such as fried chicken, cheese and chocolate, finally arriving to the magic formula for a fruity Whisky with some traditional Jura smoke to balance it off. We’re pretty sure you don’t have to be from Brooklyn to like it, though. What does Isle Of Jura Brooklyn Single Malt Scotch Whisky taste like? The Flavour Spiral™ shows the most common flavours that you'll taste in Isle Of Jura Brooklyn Single Malt Scotch Whisky and gives you a chance to have a taste of it before actually tasting it. O.K. for once a year, not for a steady drink. Smokey and sweet. My kind of scotch. The only note I got was smoke flavor. It was too much for me. I'm not a huge Jura fan (though I happily drink it when offered) as I prefer a slightly lighter Speyside. But I have a friend who is mad for Prophecy and I bought her this as a gift. It's got an interesting history, which is always fun, and is a little edgier than Prophecy, having a slightly more "dirty" (big smoke, tar, a little hazelnut and hint of chocolate) finish than Prophecy. I found this an exceptional one off from Jura's excellent core and a nice addition to the collection. If this is your style, highly recommended.